When Karen Hewitt of Burlington had a gallery show at Towle Hill Studio in Corinth last month, several major Vermont artists and designers who saw it emailed Seven Days to recommend it. "Karen is like a Vermont design wonder that too few people are aware of," wrote Burlington designer Michael Jager, who helped brand the likes of Nike, Pepsi and Burton. Barbara Zucker, a Burlington sculptor who cofounded the country's first women's art gallery, A.I.R. Gallery in New York, wrote, "[C]ommissions of hers have been featured in major museums. She is one of our hidden treasures." If Hewitt has remained "hidden" to some, it may be because her work's target audience is roughly between 1 and 6 years old. Hewitt designs toys, mostly hardwood blocks painted in vibrant colors and packaged in wooden trays. For 34 years, she manufactured and distributed them through her business, Learning Materials Workshop. She closed it in 2012 but continues to design new toys. At the Corinth gallery, colorful blocks in intriguing shapes — flat, notched rectangles; slanting, semicircular strips — formed inventive structures. Some of these creations extended from tables up the walls, where Hewitt had adhered them in playful arrangements. At the talks she gives on early-childhood education, Hewitt says modestly, she's known as "the block lady." That vastly underrepresents Hewitt's achievement. For one thing, the 74-year-old is among the country's leading authorities on educational toys. She is a proponent of toys that encourage open-ended play — such as wooden blocks that come without directives. In the late 1970s, supported by a National Endowment for the Humanities grant, Hewitt studied the history of educational toys. The result was a major exhibit, "Educational Toys in America: 1800 to the Present" — co-curated with historical preservationist Louise Roomet — which began at the University of Vermont's Fleming Museum in 1979 and traveled around the Northeast. The exhibition catalog remains a foundational text on the subject. And Hewitt's objects of play double as art. New York's Museum of Modern Art, Museum of Arts and Design and New Museum of Contemporary Art have all commissioned her to make building toys. One result is a Bauhaus-inspired block set in red, blue and yellow, for which Hewitt plumbed the Wassily Kandinsky archive. Another is a rendering of the curvilinear Museum of Art and Design's logo in plain maple blocks. Hewitt speaks nationally on the intersections of design, play and education. She's equally likely to appear at the National Building Museum in Washington, D.C. (where she spoke to architecture aficionados in 2011); at an art gallery such as the former Proteus Gowanus in Brooklyn (during a 2008 exhibit on play); or at a Head Start program in East Harlem. Hewitt often addresses preschool teachers on the benefits of open play, a phenomenon she has spent her life observing in young children. She draws her facility in addressing these widely different audiences from her training in both art and education, which includes a bachelor's in studio art from Oberlin College and a master's in early-childhood education from the progressive Bank Street College of Education in New York City. During Seven Days' recent visit to her Henry Street home, Hewitt, petite and short-haired in a flowing blue top and wood-bead necklace, recalls her aha moment when she realized she could pursue both her interests at once. "I saw a catalog for a show called 'Play Orbit'" — a 1969 exhibit of artist-designed toys at the Institute of Contemporary Arts in London — "and I said, 'That's it. I'm going to do that.' It was making things without having to make it art; it took the pressure off." Pressure seems to have been part of her upbringing. Hewitt grew up in Manhattan, and graduated from high school at the age of 16 and from college at 20. That year, she married Vermont-born artist Francis Hewitt — they had met at Oberlin — and went directly on to grad school. Hewitt taught preschool after receiving her degree in 1965. By that time, Frank (as she calls her husband, who died in 1992) had founded the New York arts collective Anonima Group with several male artist friends. Hewitt still made art, but that made Frank "uncomfortable," she recalls. Hewitt exhibited only one piece of "high" art, as she calls it with a laugh, and only at Anonima's shows. The piece had no name; brochures from the era advertise the group's "paintings and drawings and" — in smaller type — "a motorized construction by Karen Hewitt." Created between 1962 and '69, when interest in optical illusions — so-called op art — was sweeping the art scene, the construction included 72 spinning discs painted in as many patterns. Viewers could install their chosen pattern and adjust the spinning speed and direction using rheostats. "My machine," as Hewitt calls it, is now owned by the Museo de Arte Contemporáneo de Buenos Aires and will be shown at New York's El Museo del Barrio in the spring as a seminal example of op art. But for Hewitt herself, it represented the achievement of a different aim: to make art that left the final act of creation to the viewer. Designing toys was a new way to pursue that goal. Children would be the creators; Hewitt's open-ended toys, their medium. Hewitt climbs the stairs to her attic studio and opens the door. Multiple skylights and white walls and tables show off her toys, which she has arranged chronologically. The initial impression they make is one of dazzling color. "She has an enormous understanding of color," notes Zucker in a phone call. "She's as much an artist as any of us; she's an applied artist." In one early edition of Hewitt's notched rectangular blocks, called Tinte, 42 of them, each painted a different color, are arrayed inside a flat box with a sliding Plexiglas cover. The whole thing can be hung on the wall like an artwork. The one in Hewitt's dining room looks right at home among works by Frank and their son, Corin Hewitt, who is also an internationally recognized artist. Hewitt slides the cover off and reveals the blocks' reverse surfaces of unpainted maple. The wood's grain patterns give children a "richer experience," she explains. Pointing out one piece's dark spots, she observes, "Those might make them think of ants." Given the high quality of these products, it's no wonder Hewitt's business never quite hit pay dirt. Top sales reached $232,000 in 2004 when the Learning Materials Workshop was selling toys to FAO Schwarz, specialty stores, and the scholastic and European markets. Even after moving most of the production to China in 2005, which cut production costs in half, "We were always on the edge," she says. Then, too, the Workshop began with a distinctly uncapitalist bent. Hewitt started it after moving, while pregnant, to Vermont in 1970 — Frank had been hired at the UVM art department — and then giving birth to Corin. "I really needed something to do," she recalls. So, in 1971, Hewitt proposed to the UVM Home Care Enrichment Center that she start a workshop space on its upper floor, where she'd develop toys for the daycare. UVM agreed, hiring Hewitt, two low-income mothers of children in the program and two at-risk high school students. Hewitt armed her staff with a few basic tools and collected found or recycled materials. From shuttered factories in Burlington and in Corinth, where the Hewitts have a cabin, she scored a cache of wood bobbins. "I worked with low-income parents, saying, 'You don't have to buy expensive toys; you can make them,'" Hewitt says. Her first toy was produced to raise funds for the Workshop. Using bobbins, a few dowels, a small board and much feedback from the children downstairs, Hewitt created the Thingamabobbin. Its movable parts allowed it to roll like a car or become a pegboard, a noisemaker or even a sailboat. In 1975, the Workshop produced 100 Thingamabobbins and painted them red, white and blue for the country's bicentennial. A photo from the time shows one being pulled on a string through the streets of St. Louis, Mo., with press photographers snapping from the curb. The Thingamabobbin won Hewitt her first of many toy awards. A marketing effort would have helped to sell more, but Hewitt had other interests. She had noticed that nearly every toy on the market was billed as "educational." That drove her research, funded by two NEH grants, into what made a toy educational — or "instructive," as 19th-century marketers termed it. "Our conclusion," says Hewitt, "was that there's no such thing as an educational toy. Anything a child touches is educational — even Barbie dolls. It's a matter of what they teach." Toys that teach sexist or racist stereotyping, break easily or are used to sell things are all unhelpful, she opines. And plastic isn't necessarily worse than wood, Hewitt adds. It may be visually less varied, but it doesn't warp. Some of her toys include plastic parts: Curvilinear has flexible tubes; Prismatic is a tray of cubic blocks half made of clear acrylic. In that latter instance, the choice was clearly artistic. The plastic "refracts the light," reads the website description, allowing children to "experience the beauty and wonder of the color spectrum." Many of Hewitt's toy names are Italian: Arcobaleno, Simmetrico, Coloraturo, Carosello. Her love of that country's uncanny cultural knack for design began in 1984, the year the Hewitts lived in northern Italy. 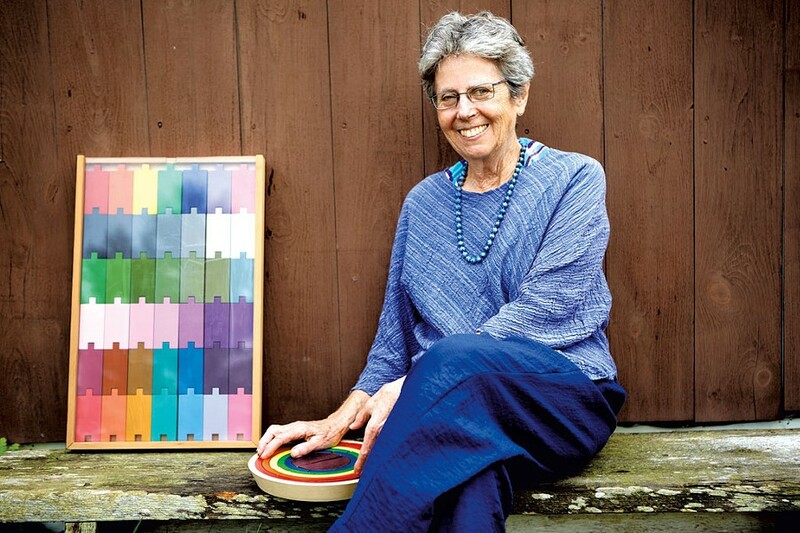 Hewitt returned in 1993 to study the town of Reggio Emilia's self-directed, art-focused approach to education, which is often compared to the Montessori or Waldorf methods. She is now the North American distributor of Reggio Children publications. The Campus Children's School, as UVM's preschool is now called, cites Reggio as an influence. 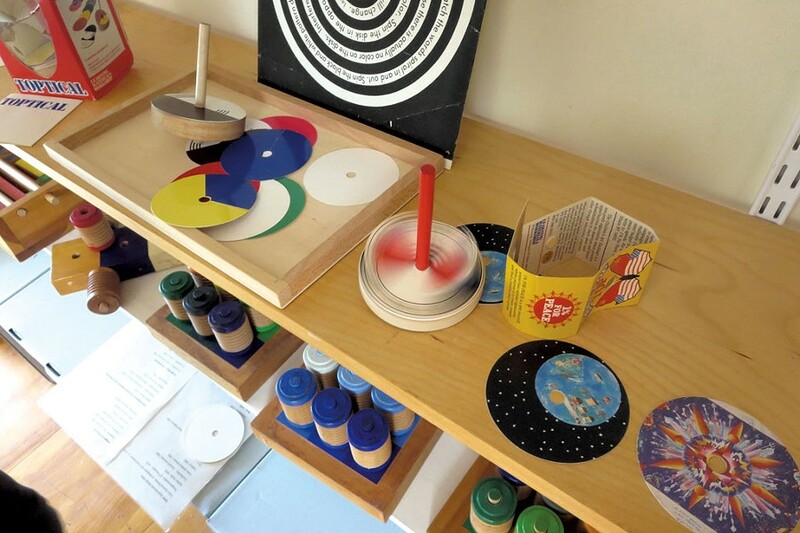 In the Workshop's later years, that center and the Burlington Children's Space became Hewitt's observation and toy-testing environments. Hewitt incorporated Learning Materials Workshop in 1978. By 1986 she had grown her business enough to move to new digs on North Winooski Avenue, gaining an assembly and packing space. Packaging was designed by Hanley Salzman Designs, Ken Burris was product photographer and Carol Hanley designed the catalogs. But the operation never employed more than a few people, says Lu Kane, who worked for Hewitt for 28 years until the Workshop closed. "The Arcobaleno  had just happened when I got there," recalls Kane during a phone call. She still lives in the same Winooski house where she first painted blocks for Hewitt part-time while running a home daycare. "Karen was bringing [the pieces] in sacks to my garage — and they were heavy, and she was doing it herself. I realized, This is a really small operation." In 2002, Hewitt finally hired a marketing director. A former UVM art department colleague of Frank's, Meg Walker is a conceptual sculptor in Charlotte with experience in textile design. "The toys had very open-ended materials and minimal design, and that was all stuff I was interested in. She had a similar aesthetic," Walker says by phone. But a real marketing budget was beyond Hewitt's means, and the 2008 recession cut funding for early-education programs — a major buyer. "That's when it began to be really hard," says Walker, who worked for Hewitt until the business closed. Walker and Kane are among the lucky ones who acquired Hewitt's toys before they went out of production. The Learning Materials Workshop website still displays each item; Jager's design firm, Solidarity of Unbridled Labour, is in the process of recasting the site as an archive. Two years ago, Solidarity (then Jager Di Paola Kemp) located a New York backer to form a new company that would return Hewitt's toys to production and bring in other designers, but the backer pulled out last year. With Solidarity's Byron O'Neill, Hewitt is currently designing a new toy. Kane and Walker continue to watch children and grandchildren play with Hewitt's creations. Kane observes that children "don't get frustrated, because you can build and do what you want with them. The kids figure things out." "What's amazing is it's so open-ended," Walker agrees. "You can create all kinds of different sculptures; there are no instructions for how you use these materials." Corin Hewitt, who recently won the coveted Chuck Close Rome Prize for visual art, cites his mother's huge influence on his work in an email from Germany — "specifically, my mother's belief in the importance of structured yet open-ended and non-deterministic systems of play." Similarly, his own work "propose[s] a way of thinking but allow[s] for unpredictable subjective response." Corin, who has a 16-month-old daughter, is waiting until the family's return to the U.S. to introduce her to his mother's toys. When the baby encounters them, they will likely set in motion a rich response seen in the "thousands and thousands" of children, Karen Hewitt notes with pleasure, now playing with Learning Materials Workshop toys. Says Hewitt, "Is it art? Is it play? It's all that. It's not an either/or." The original print version of this article was headlined "Playing for Keeps"
What's the Deal with the Bennington Potters North Mural?